With missions such as EM-1 and InSight preparing to deploy interplanetary CubeSats to the Moon and Mars, and studies of mission concepts for such spacecraft at asteroids and Europa, the time has come for a generic high-resolution survey orbiter interplanetary CubeSat platform that could be flown as standard with such missions. SUPER-SHARPi (Space-based Unfolding Primary for Exploration and Research via Spectroscopic High Angular Resolution Photography – interplanetary-CubeSat) is 1.2m space telescope packaged within a standards compliant solar powered rad-hard 3U CubeSat platform, capable of capturing ground images with 30cm resolution from 400km. Other formats could permit apertures of 2m or more. The spacecraft is built around a SUPER-SHARP self-aligning mirror sub-system (designed to be available as an off-the-shelf drop-in subsystem for other applications), with modular avionics and sensors that can be used as is or substituted with custom end-user components as missions require. A prototype is currently being assembled, with flight hardware for an on-orbit demonstration to follow shortly. 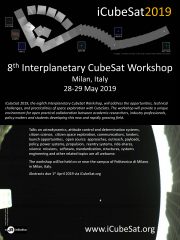 Applications might include an orbiter for Europa, performing imaging flybys of multiple near-earth asteroids, fly-through/impactor probes for ring studies, or any application that needs Hubble class imaging in a CubeSat package.